A large number of SME have still not embraced the opportunities presented by internet marketing, including social media, a recent article I read claimed 40%+ of small businesses do not have an active website. As a result due to the time lag between adoption and implementation & ROI, many small businesses will lose ground to their competitors, who started the learning process earlier. 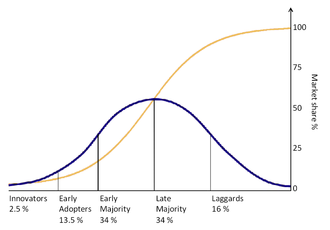 What worries me the most is most small business owners (and many senior managers in larger companies) that I meet seem rather proud of their distinctive Luddite or Laggards profile. As if being curious or inquisitive of the internet is beneath them or beyond their capabilities, so they sit and wait for it all to be explained and implemented into their business. Meanwhile the businesses lose significant competitive advantage, the learning curve is as steep as it is rewarding. Like other aspects of business, you have to learn and get involved. A key role of the Executive Director or Owner of a business is to identify new opportunities, and understand how they can add value to the business to create a competitive advantage. A SME business leader in 2013, should have an understanding of how essential the Internet is to reach the company’s potential customers, cheaper and more efficiently than many the current / traditional marketing activities. Who is in charge of Internet Marketing in your company? Who organizes your Company Content online? Who set the goals for the Website and Social Media? How often does your company analyze your Website Analytics? Who coordinates Social Media with other company activity? I provide Executive Training / Coaching in customized half day or full day seminars, on a one-to-one basis or to small team. The seminars are working sessions, focused on your business and industry, and structured for busy executives and business owners, to gain significant practical knowledge of Internet Marketing and SEO in a short time period, that would take months to learn by books and your own research.